THIS highly interesting work is situated in Butler county, Ohio, on the banks of Seven Mile creek, five miles north of the town of Hamilton. It is formed by two irregular lines of embankment, and an exterior ditch, cutting off a jutting point of the second terrace; and has an area of twenty-five acres. These embankments are parallel throughout, and were evidently both made from the same ditch. The outer one has an average height of four, the inner one of three feet. The ditch is between five and six feet deep, by thirty-five feet wide. At the southern portion of the work, both walls and the ditch have their greatest dimensions. The side of the work next the stream is bounded by an abrupt natural bank, eighteen feet high. Distant a few rods from the north-eastern angle of the work, is an elliptical mound eleven feet high; its conjugate and transverse diameters are ninety-two and one hundred and eighteen feet respectively. This work has a single gateway thirty feet wide. The inner wall, near its southern extremity, curves inward along the terrace-bank for a considerable distance. The first, or creek terrace, is a low alluvion, not subject to overflow. It is evident, however, that the creek once ran at the base of the natural bank (now bounding one side of this work), probably at the period of its construction and occupancy. Tins work affords a very fair illustration of one portion of the defensive structures of the West, already alluded to in the general remarks on the subject, at the beginning of this chapter. It occurs in Oxford township, Butler county, Ohio (Lot 6, Sec. 31, Tp. 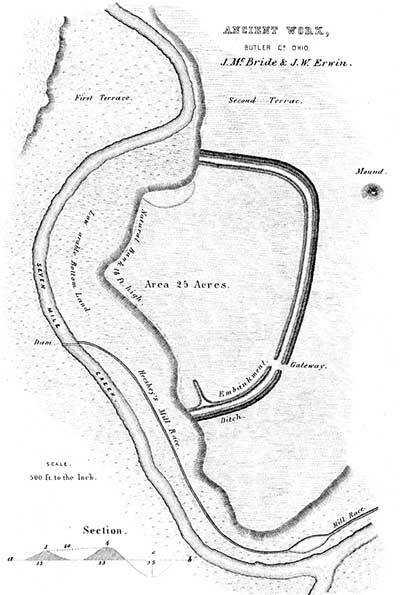 5, Range 2, E. M.), at a point on Four Mile creek, where that stream forms a remarkable bend, constituting a peninsula one thousand and sixty feet across at its neck, and one thousand three hundred and twenty feet deep. This peninsula is, in fact, a bold head-land, with precipitous banks, rising sixty feet above the water in the creek, and overlooking the low bottoms that surround it. Across the neck of this peninsula is carried a crescent-shaped wall with an outer ditch. The wall is now but little over three feet in height, and the ditch of corresponding depth. Formerly it was much higher, precluding cultivation. It has been reduced by the present occupant, who has ploughed along it longitudinally, throwing the furrows into the ditch,—a common practice, which is fast reducing and obliterating these interesting monuments of antiquity. A single gateway twenty feet wide leads into the enclosure, which has an area of twenty acres. A terrace, apparently artificial, and thirty feet wide, occurs on the northern bank, at about midway from the water to the top. It may be a natural feature, and caused by the subsidence of the bank from the undermining of the stream. The creek, at one time, unquestionably ran close under the banks of the peninsula; whether or not the recession, leaving the intervening low bottom, B, took place subsequently to the erection of the work, it is of course impossible to determine. In this work will be remarked the lapping round of the parapet, on the natural bank of the stream at b,—a feature heretofore mentioned, as probably designed to protect the flank of the defence. Among the works remarkable as possessing double walls, is the one here presented. 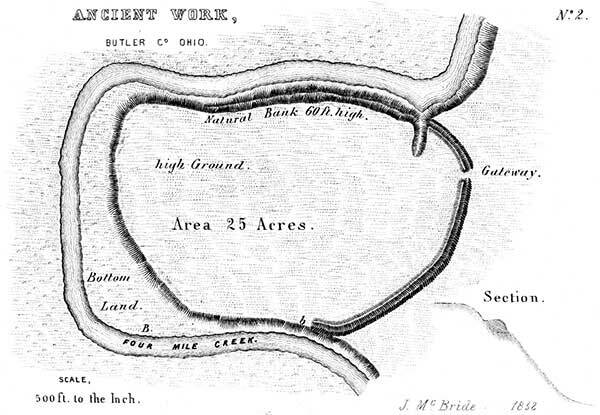 It is situated on the Great Miami river, four miles south-west of the town of Hamilton, Butler county, Ohio. The plan obviates the necessity of a detailed description. 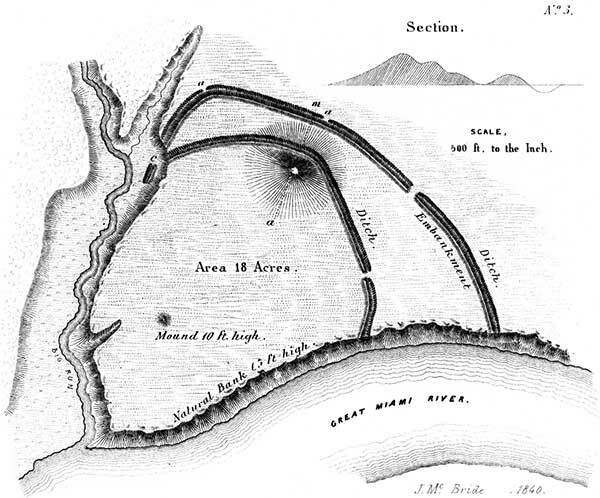 The outer line of defence consists of a simple embankment five feet high, with an exterior ditch four feet deep. It has a single gateway fifteen feet wide. There are apparent gateways at a a, but the ditch only is interrupted. Interior to this line of embankment, is another of less dimensions, having also but one opening. At b is a large broad mound, over which, and somewhat below the summit on the outer side, the inner line of embankment is carried. The ditch also continues uninterruptedly over the mound, which is thirty feet high. From its summit, a view of the entire work and surrounding country is commanded. Another mound, ten feet high, occurs at the point indicated in the plan. It is composed of stone and gravel, apparently taken from the river, and probably belongs to the class of mounds denominated "sacrificial,"—the characteristics of which are explained in another chapter. At c, the outer wall appears to have formerly extended down to a lower level; but it has been much obliterated by the washing of the bank. The natural banks, on the side towards the river and next to Big Run, are inaccessibly steep, and between sixty and seventy feet high. The area, embraced within the exterior lines, is a trifle less than eighteen acres. The defensive character of this work can hardly be doubted. It has been suggested that the large mound, over which the inner wall is carried, was designed as a look-out, or alarm post. This may not have been its primary, but it is not impossible that such was its secondary purpose.